Everyone hopefully knows by now that the Turkish Get Up is a great move for a variety of reasons. Experts, from Gray Cook to Mike Boyle, all speak about the numerous reasons to include it in your training. Works through the three fundamental postures (lying, quadruped, and kneeling) before transitioning to standing. The down side of this is that people start to miss the other side of the coin. When we focus on strength it’s common we’ll lose flexibility and/or endurance. When we run a lot we’ll likely lose strength and/or flexibility too. Just like muscles, exercises tend to come in opposing pairs. When you bench, you should row. When you overhead press, you should do pull-ups. When you hinge, you should squat. But what is the opposite of a get up? The problem with trying to oppose the get up is that it covers so many movements and actions. It’s got both closed-chain and open-chain shoulder stability requirements. It goes from a position of extension through flexion and back to extension. And it goes through a variety of postures, transitioning from the floor to standing. When it comes to corrective strategies there are many options. But two of the most common are to either compress or distract the joint. Compression strategies are easy—those are exercises that teach it to do its job under load. A good example of a corrective compression exercise is the kettlebell armbar, which teaches shoulder stability while the joint is under load. The opposite of this would be a distraction strategy and a good example for the shoulder would be the suitcase deadlift, which teaches the shoulder to remain packed while fighting the exact same rotation forces that the armbar delivers. 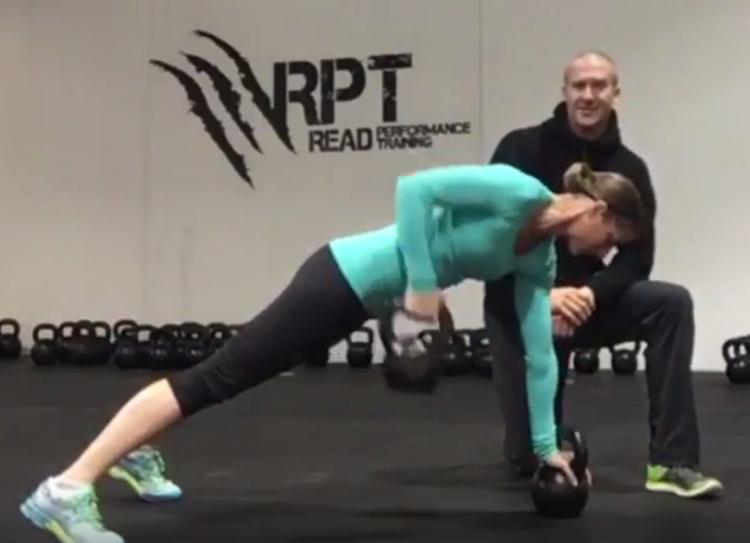 Looking at the get up, it’s pretty clear that the exercise involves a compression strategy on the side holding the kettlebell and a distraction strategy on the hand that supports the body. So our opposing exercise must have both compression and distraction, just like the get up. It also needs to be a movement done entirely, or nearly entirely, in extension and instead of focusing on all the various rotational aspects like the get up, it should be all about midline stability. The opposite of the get up is the renegade row. The last point, in particular, is worth paying attention to, as most training plans these days don’t feature anywhere near enough rowing. Most exercises lumped into the functional training category involve only scapular control in neutral. Exercises such as kettlebell swings, get ups, barbell cleans and snatches, and deadlifts only require maintaining postural control and don’t require working the scapular retractors through full range. In terms of balancing workouts, many rightly seek to match the volume of pushing and pulling together. In the world of functional fitness the pull-up is often seen as the king of pulling exercises. The only problem with that is that the lat connects to the upper arm and acts to internally rotate you. You know how most of the things we do in the gym are done to get you out of that horrible position? Well, chin-ups and pull-ups only contribute to it. To balance out all the other internal rotation work you do (any pushing exercise as well as vertical pulling like chins and pull-ups) you need scapular retraction work. The renegade row fits that bill perfectly. I like to front load programs so the most essential elements are done first. Believe it or not, that isn’t strength in most cases. Most people can’t hit baseline movement standards; they are dysfunctional. To rectify that they need extra mobility work. So our sessions at Read Performance Training begin with about ten minutes of joint mobility work. They then move onto targeted flexibility work before finally getting to the strength part of the workout. Targeted flexibility work isn’t necessarily stretching, and it’s quite common for it to look like strength work to the untrained eye. Light goblet squats, get ups, halos and renegade rows are actually range of motion exercises if done right. They also act to balance out all the other environmental elements of people’s lives. Warm up with joint mobility work for 10-15 minutes. Perform 5 renegade rows each side, alternating sides each rep. Perform 10 halos each way from half kneeling. Perform 1 get up each side. Perform 5 full depth goblet squats, taking two slow deep breaths at the bottom of each rep.
Don’t be surprised if your body starts to feel considerably stronger and more stable after adding in renegade rows to your everyday warm up. The extra core work and scapular retraction will add up quickly seeing you hit new PRs. A lifelong athlete and coach, Andrew Read has seen it, then tried it and then tested it. He has trained hundreds of athletes and clients up to Olympic and World Championship levels. He has tested his theories on himself from everything to special forces selection to Ironman to martial arts competitions. He is not tied to a single tool or method, but has an extensive tool box from which he can choose the right solution for each athlete. His training methods are blue collar and basic. There are no attempts to hack performance. Just age-old methods crafted to guarantee improved performance. He has worked hard to meld the training of mind and body together through his three simple rules on training—turn up, don’t complain, never quit.